First of all I'd like to thank Mr. Roberto Fasciani and all the Ipermedia staff for supplying me most of the material for this page. 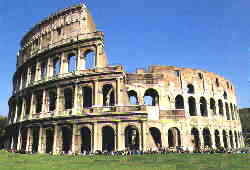 Their site contains a lot of useful travel information, if you plan to visit Rome give it a try. Please do not bookmark/link to this page directly but to my main page http://www.geocities.com/gorlik. This will prevent any broken links when I change the page layout and allows me to get accurate statistics on the site usage. Thank you. 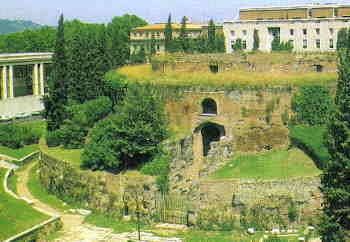 The hill which was the first nucleus of city life in Rome became thereafter the Imperial Headquarters. It is surmounted by the Villa Farnese, which, with its many gardens and staircases, covers much of the hill, and hence a good deal of the architectural remains of the Roman age. It was in the dirt around the base of this hill that Romulus drew the sacred line that outlined the confines of his city. In 9 BC, this altar was built to commemorate the great peace after the Gallic and Spanish campaigns. The Ara consists of a rectangular enclosure inside of which is found the actual altar. 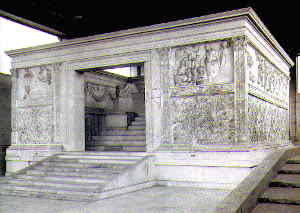 The most significant scene in the mostly restored bas-relief is the one depicting Augustus, Agrippa, Julius, and Tiberius. Along the base of the wall that runs along the Via di Ripetta is a bronze reproduction of Augustus' testimonial plaque, called by historians the "Res Gestae" (Deeds accomplished). 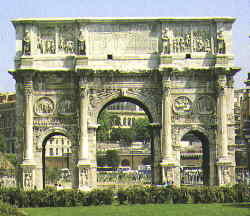 The People and Senate of Rome built this arch out of pre-existing materials in 315 AD for both the tenth anniversary of the great emperor, and in honor of his victory over Maxentius at the battle of Ponte Milvio in 312. This oval basin, nearly 600 meters long, is almost entirely filled in with dirt. 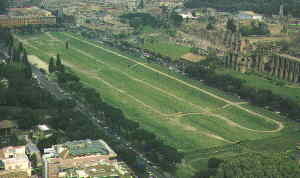 It was once a race track. It was made in the time of the Etruscan kings (presumably Tarquinio Prisco). 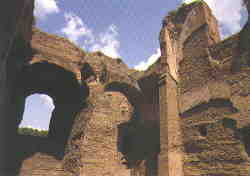 Augustus adorned the brick structure with an imperial stage, which was rebuilt by Trajan, enlarged by Caracalla and restored by Constantine. During the reign of Constantine, the Circus could hold more than 200,000 spectators. Today only the outline remains (the area it occupied is now a public garden). 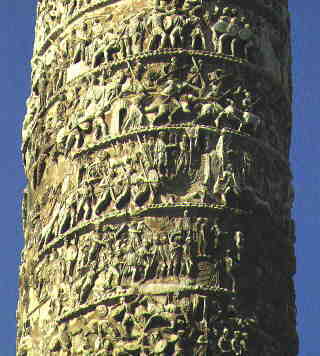 The column consists of 19 blocks of marble with a helicoidal band of figures spiraling up it, documenting the Dacian War of Emperor Trajan.On this column we see the bridges Trajan built, the forts he attacked, the camps he destroyed, and the enemy he put to flight. 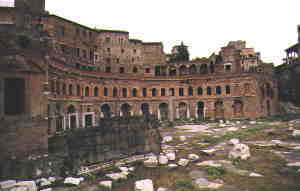 The original name for the Colosseum is Anfiteatrum Flavium. 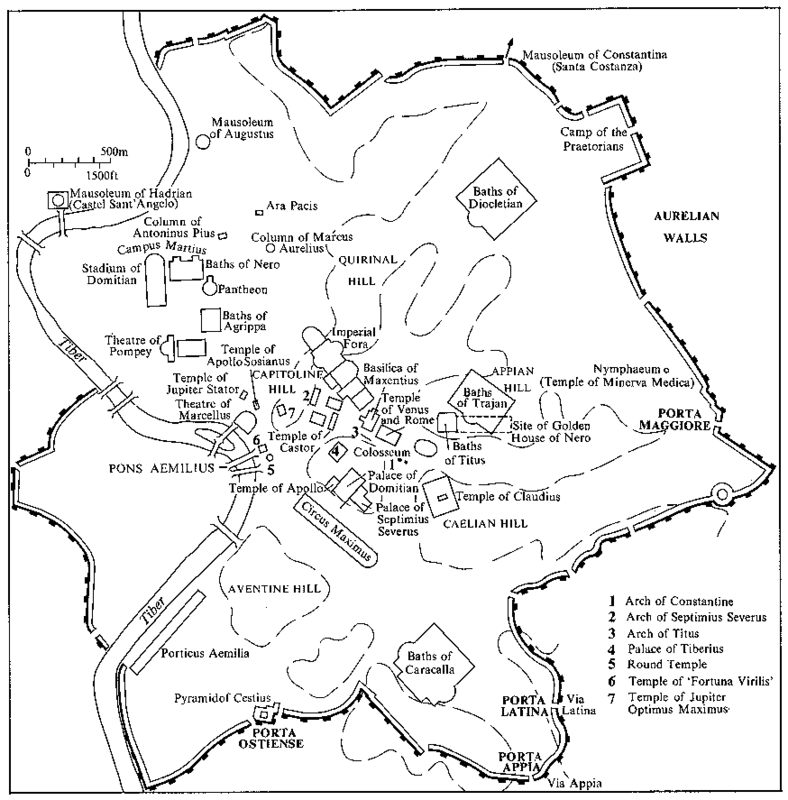 It was built by emperor Vespasiano and inaugurated in 80 A.D. In ancient times it was the site of the "Naumachie" or navy-battles, the "Munera" or gladiator-fights,and the "Venationes" or wild animal-hunts.It could hold up to 87.000 people. 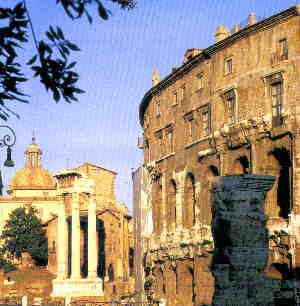 Forum of Caesar, Augustus, Pax and Trajan (including Trajan's Column) and Trajan's markets, mark the passage from the Republic to the period of Empire and constitute the archaeological area of the Imperial fora. 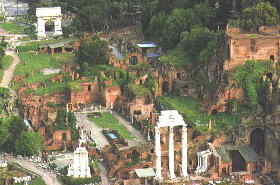 The Roman Forum was the centre of the civic and economic life of Rome in the Republican era and kept its prominent role even in the Imperial age. 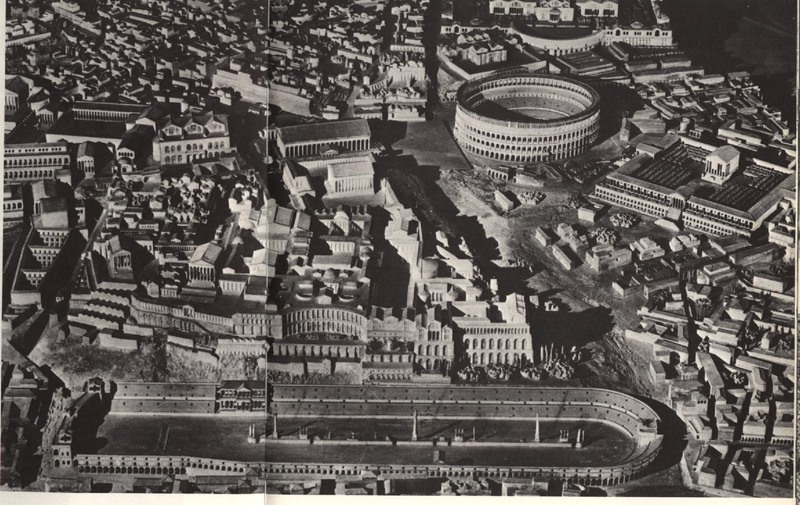 The monumental complex lies between the Capitol, the Imperial Fora, the Colosseum and the Palatine. Built in 27 BC, the Mausoleum was pillaged as a source of building materials (the many evident thefts reduced it to its current dimensions). 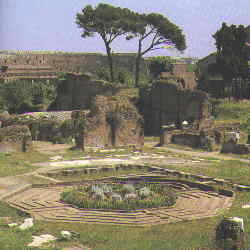 It then became a vineyard, a hanging garden, an amphitheater, a theater, and an auditorium. It was originally 44 meters high, in the form of an Etruscan tumulus, planted with cypresses and crowned with a bronze statue, inside of which there was a space for the remains of Augustus. Around the central pillar were the graves of the more distinguished members of the Giulio-Claudia family. The inscription on the architrave of the portico "M. Agrippa L. F. Cos tertium fecit" refers to a temple erected by Agrippa in 27 B.C. to the tutelary divinities of the Julia family. In reality Agrippa's building was destroyed by a great fire in A.D. 80. 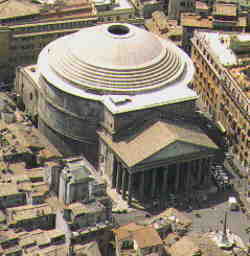 Recent studies have proven that the present Pantheon is a reconstruction of the temple from the time of Hadrian. The interior measures 43,40 metres in diametre, and the same in height. Light and air still enter through the opening at the top (a circle of 8m. 92cms in diameter). 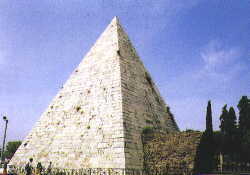 This piramid was built during the last years of the Republic (1st century B.C.) to hold the ashes of Caius Cestius, Praetor, Tribune and Septemvirate of the Epulos, as the inscriptions recall. Courtesy of "Roma ieri, oggi e domani" Newton & Compton Ed. Begun by Caesar and dedicated thereafter by Augustus to the memory of his nephew and son-in-law Marcellus, this was one of greatest theaters in ancient Rome. It could hold around 15,000 spectators. It was used as a source of building materials, then as a medieval fort belonging to the Pierleoni family. It was then transformed by Peruzzi the architect into a sumptuous renaissance palazzo for the noble Savelli family. 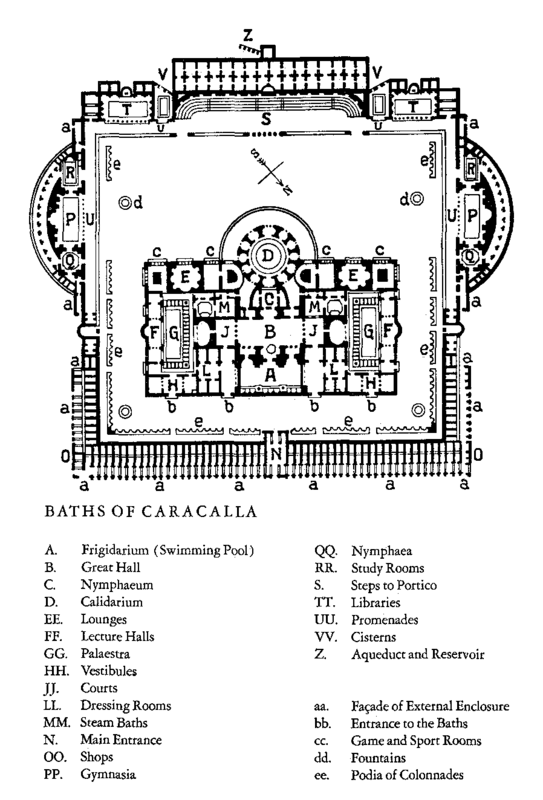 The Baths of Caracalla, or the Antoninian Baths, were begun by Septimius Severus in 206 and inaugurated in 217 by Caracalla. Sixteen hundred persons could bathe here at the same time. There were rooms for cold, hot and warm baths, splendid ceilings, porticoes, pillared halls, gymnasiums, where the rarest marbles, the most colossal columns, and the finest statues were admired by the people; even the baths were of basalt, granite, alabaster. 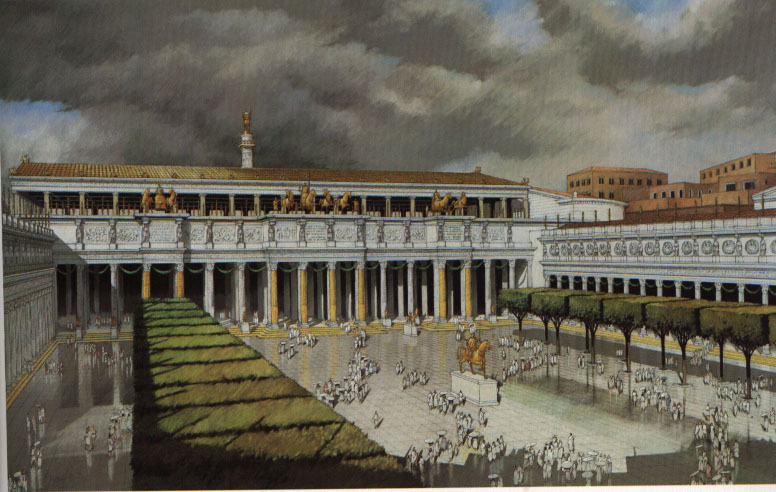 Situated in Rome's Forum Boarioum, this temple known as Fortuna Virilis is dedicated to Portunus, tutelar divinity of the port on the nearby Tiber. Built approximately in 100BC, the temple is tetrastyle on a podium reached by a flight of steps.